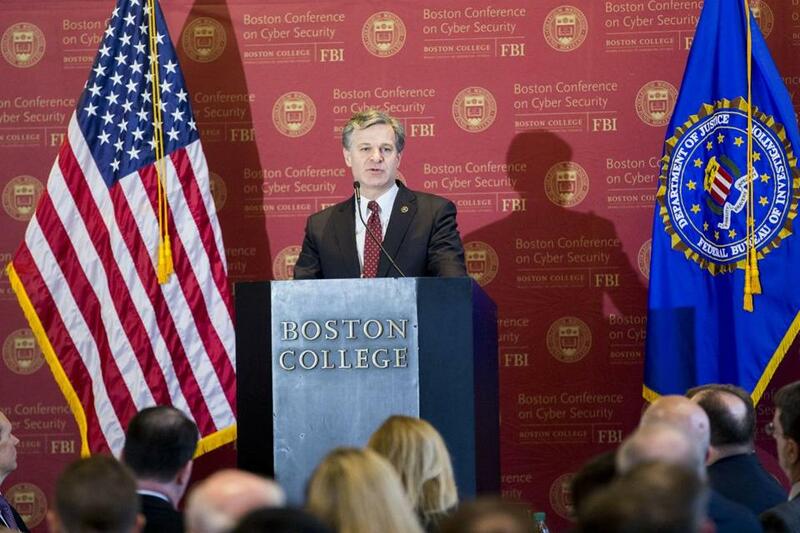 FBI Director Christopher Wray gave the keynote speach at the Boston Conference on Cyber Security at Boston College on Wednesday. Wray cited an increase in state-sponsored cyber intrusions linked to North Korea and Russia as examples of the growing danger of such threats. But the FBI, Wray said, is fighting back. The conference was presented jointly by the FBI and the Masters in Cybersecurity Policy & Governance Program at BC’s Woods College of Advancing Studies. Wray said the bureau’s efforts to shore up its cyber crime defenses has paid dividends. Another vanquished target of the FBI was the Kelihos botnet, according to Wray. He urged companies to contact the bureau if they feel they’ve been targeted by hackers. Travis Andersen can be reached at tandersen@globe.com.